As the days get longer and we are out of the house more with sports or other afternoon activities, coming up with healthy dinners each night, let alone having time to make them, can be difficult. I like variety, but two nights a week are predictable. We always have Taco Tuesday and home made Pizza night on Fridays. Two other nights are leftover nights, so that leaves just three dinners I need to plan for each week! I love simplicity! Taco night for us is really “Whatever Mexican Inspired Dish You Want to Create From the Available Fixing” night. I set out a bunch of fixing on the table each Tuesday night and everyone can dish up what they like. Chopping a few things and heating others doesn’t take much time, so Tuesday nights are a breeze and everyone is happy. I simply have to remember to take meat out of the freezer in the morning (unless I have leftovers I can use) and make sure I’m stocked up on the essentials when I do my grocery shopping. I don’t like to use packaged taco seasonings as they contain way to much salt and usually have additives and modified food starches, so I make my own. 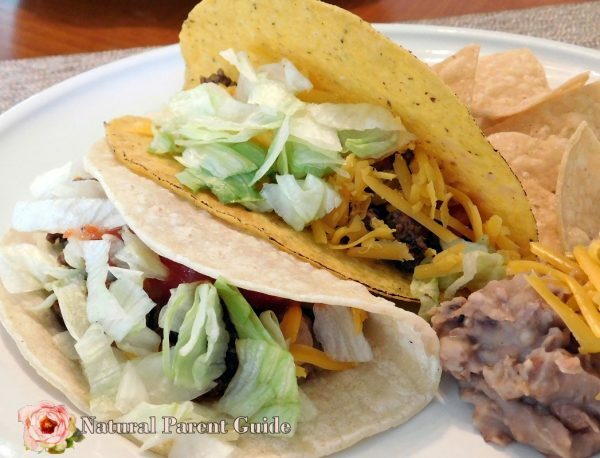 Here’s my recipe for DIY clean eating, gluten free taco seasoning mix. The kids enjoy it so much more when all the toppings are available and they can pick and choose to dish up exactly what they want. They also like that they can change it up each week from a burrito to a taco or a soft taco or even nachos. My daughter likes to have a quesadilla and chips with bean & cheese dip. She’ll fix hers up and go microwave it to melt the cheese. I got really tired of carting all these toppings to the table and clearing up, even when the kids do it, it takes time, so now I put everything I can fit onto a tray, take that whole tray right to the table and it even makes clean up easier. Little ones tend to always drop some of what they’re dishing up onto the table, but now much of it can fall back onto the tray! Sometimes I am brilliant! Or maybe you thought of that years ago and I’m just a bit slow. Either way, I’ve been happier with our quick and easy Taco Tuesdays. Sometimes I change up the taco toppings by adding spinach to the shredded lettuce or putting out cilantro or cabbage. You can get creative. We’ve even made Bok Choy Beef Tacos when we had extra from our produce CSA box. It’s a different flavor, but still good! What do you like on your tacos? How about your kids? I serve salad with our tacos since I don’t really like tacos but I will make a taco salad for myself. 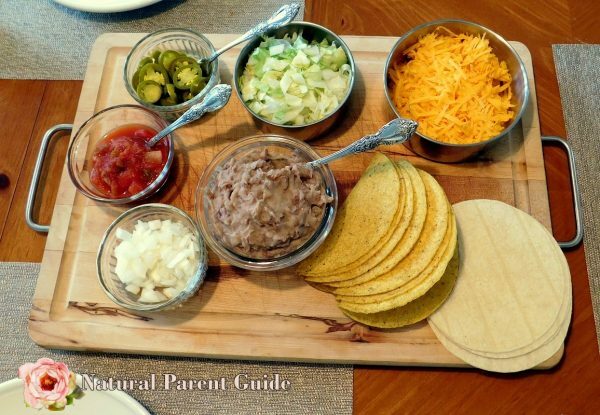 I have to leave some meat plain without seasonings for my youngest but I still think of taco night as a quick and easy meal that everyone will eat without complaint. 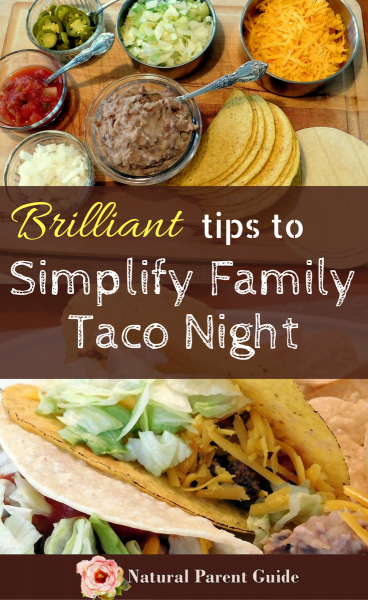 My family would be thrilled to eat build-your-own tacos…every single night! 🙂 We do something similar with build-your-own chef salad. Suddenly I’m in the mood for tacos for dinner this weekend.